If you’ve ever nearly sustained a shoulder injury from the weight of your purse, then you know just how ridiculously heavy our day-to-day belongings can become. We carry way too much around with us on a daily basis, not to mention when we’re traveling. If you’re seeking one simple, inexpensive beauty tool to fit numerous uses, you may want to stock up on cotton swabs to make your load a little bit lighter. Dab a cotton swab into a liquid or cream concealer and store in a small plastic bag to hide those pesky trouble spots, like under your eyes and around your nose, throughout the day. You can do the same with translucent powder for long-lasting, crease-free makeup, says beauty expert Christina Marrale. Eyeliner a little too thick, uneven, or just not the shape you want? 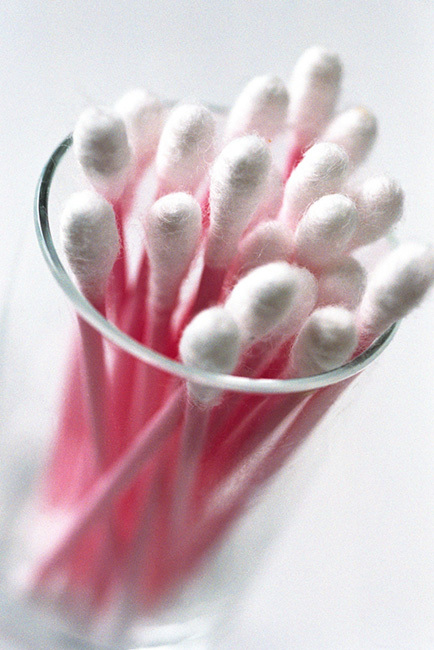 No problem—take a cotton swab and wet it lightly, says Haley Kulow, CEO and Founder of HK Beauty Consulting. Twist the edge of the swab over the liner spots that you want to reshape, and watch as it erases the liner by smudging on the q-tip, not your face. Avoid pulling at the skin when applying your nightly eye treatment, which can result in damage and wrinkles over time, by using a cotton swab for a gentle, seamless application. Simply dip the cotton swab into your eye cream and lightly apply around eye area until fully blended, says Marrale. Some of our favorite lip products come in pots rather than tubes or sticks. Keep q-tips on hand to dip and apply without having to worry about about spreading germs or depositing bacteria from your skin into the product, says Kulow. Use as a makeup brush in a pinch. Cotton swabs make for a great blending brush to smudge eyeliner and blend out any harsh edges on-the-go. “It’s been a staple in my kit for years when creating a classic smokey eye,” says Marrale. Get the perfect brow shape. Take a matte brown shadow in the color closest to your brows and apply a tiny bit onto your cotton swab, then blend over your brow area. To clean up the shape, flip the swab to use the clean reverse end to apply a bit of concealer or makeup remover to clean up the shadow, leaving you with perfectly filled-in eyebrows that aren’t overdrawn, says Kulow. “Remove the soft end of a cotton swab and dip it into nail polish to create fun nail art, such as colorful polka dots,” says Jill Marcordes, Executive Director of Cosmetology & Nail Technology at Tricoci University of Beauty Culture. Perfumes often fade by the end of the day, so it’s always helpful to have a bit of a refresher for later. Carrying around an entire bottle can end up bulky and messy, but if you soak a few cotton swabs in that scent and place them in a sealed ziplock bag, you’ll have a bit of portable fragrance that’s ready for a mid-day refresh! Clean up your messy manicure. “My favorite beauty tip is to use a pointed cotton swap to wipe off excess nail polish around the nail in a manicure or pedicure,” says Christina Carter, owner and creator of red beauty bar. It’s better than using your finger, which can get messy, and the precision tip on the swab allows you to remove just the polish on the skin without messing up your freshly-painted nails. Use cotton swabs to apply skin-brightening creams and lotions to just the darkened areas of skin that you want to even out. To avoid getting stains on clothing and towels from benzoyl peroxide for your blemishes, use a cotton swab to apply and toss out, instead of using your fingertips, says beauty expert Wendy Lewis of Beauty in the Bag. “When my skin lacks hydration, my concealer tends to seep into tiny lines in my face, rendering the concealer counter-productive. For a quick fix, dab a cotton swab in eye cream and gently swipe it over the lines and they will disappear like magic,” says Brittny Gastineau, model and reality TV personality.